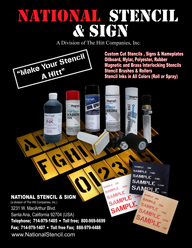 at 48" - 72" - 96"
We are your one-stop shop for stencils, paint, inks and other stenciling equipment. No matter what kind of stencil you are looking for, you can find it at our online site. We have a huge inventory of stencils to choose from, making it easy for you to find exactly the stencil you are looking for to help you with your commercial or residential signage. If you have a need for a unique or unusual design, we can also create custom stencils to meet your exact specifications. As a family-owned business that has been involved in the industrial marking industry since 1987, National Stencil is an industry leader that provides nothing but top-quality products for our customers. We have a wide range of stencil materials to choose from including oil board, Mylar, rubber and metal stencils. Our stencil designs are suitable for a wide range of uses. Along with number and letter stencils we also carry frequently-used stencil designs including parking lot stencils, storm drain stencils and more. Along with ready-made stencil designs such as letter and number stencils, we can also provide you with custom stencils for any use. You design the stencil and we create it for you! It’s a great way to create stencils for frequent use without having to go through the hassle of using different letters over and over again. At National Stencil, we stand behind the durability and craftsmanship of our products. That’s why we’re one of the few companies in the industry to offer a lifetime warranty on the majority of our products. We believe in the quality of our products and back this up with our warranty program. When you buy stencils or stenciling supplies from National Stencil, know that you are getting top-of-the-line products that will stand the test of time. We also have a great selection of supplies to help you use your standard or custom stencil. Search through our catalog to find different colors of roll-on inks and spray inks, rollers, brushes, stencil machines and other equipment. We have earned the business of our customers by providing them with high-quality stenciling supplies at low prices and we want to earn your business as well. Check out our line of stencil products to find exactly what your business needs today. © 2012 - National Stencil, a Division of The Hitt Companies, Inc.